There are so many great sound bars out there right now that’ll give any TV in your home a serious audio upgrade for less than $100. We cover them all the time because sound bars are insanely popular right now. And why wouldn’t they be? It’s so much easier to connect a single device to your TV than it is to set up surround sound. On top of that, surround sound systems are great for a home theater or living room but you don’t exactly want one on your other TVs. 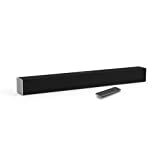 If you’re looking for a sound bar that offers great sound at a shockingly low price, check out the VIZIO SB2920-C6 29-Inch 2.0 Channel Sound Bar. Vizio is still one of the best in the business after all these years, and this model is quite possibly the best option in its price range right now. Easy Setup – Connect the Sound Bar to your TV using one of the included cables. Refer user manual for troubleshooting steps.